The "Hulk Hogan's Rock 'n' Wrestling" Collectable Erasers Connection! If you're a wrestling fan, chances are you've seen the Rocky movies several times each (Except for Rocky V). Aside from Hulk Hogan's appearance as Thunderlips in Rocky III, there hasn't been any other Rocky-Wrestling connection to my knowledge...that is until the discovery of a WWF liscensed Rocky Balboa eraser! In 1985, the same year as the release of the Rock 'n' Wrestling erasers, Winston Toys devoted a line to the hit movie Rocky IV, the one where Rocky avenges Apollo Creed's death, taking down Communisim in the process. 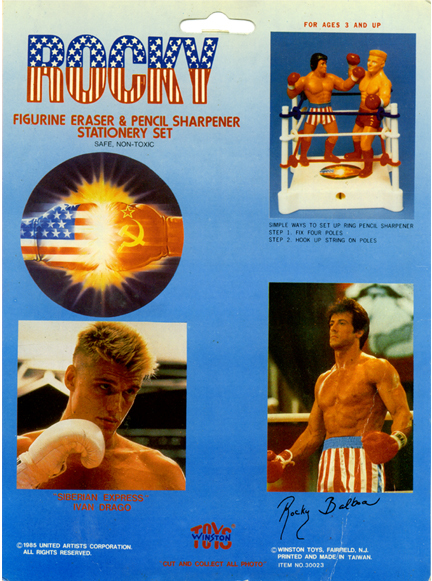 As far as I know, the line featured eraser figures of Rocky, his Soviet opponent Ivan Drago, a pencil sharpener/boxing ring, as well as a stamper which doubles as a waist-up figure of Rocky. Since i've been collecting, I have only seen 1 of the rings MOC packaged with Rocky & Drago, which I purchased on eBay. You can see a scan of the packaging at the top of the page. I don't have a pic of my actual ring, but it looks just like one pictured on the packaging. I've seen 2 Dragos (to my knowledge it's the only Dolph Lundgren figure ever) and i've seen several Rockys and own 2 of them. There is something very unique about one of my Rocky erasers; instead of the correct liscensing by UA-United Artist Pictures, he is liscensed by Titan Sports, which is the former name of the parent company of the WWF! Obiviously some accidental mix-up by the good folks at Winston Toys between their WWF line and their Rocky line, this figure stands as possibly the only WWF-liscensed Sylvester Stallone item on the planet! I have no clue as to how many of these error Rockys could've gotten out to the public, but I imagine it couldn't be very many. It seems to me like an error in something as important as a figure's liscensing would be caught pretty quickly. All other Rocky erasers i've seen, including my other one, have the correct UA liscensing on the back. You can see a comparison in the picture below. It may be a little hard to see without looking at the actual figure. 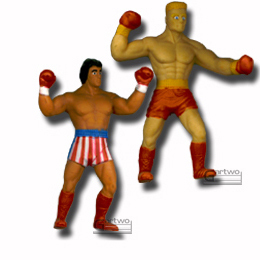 If anyone out there has any additional information on this Rocky IV line of figures, especially about the Rocky-Titan Sports error please email and let me know about it.